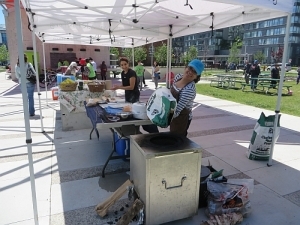 From the October 2015 Newsletter: After CELOS got a grant from the GH Wood Foundation to use our tandoor at a few other parks, we got worried that we couldn’t deliver – many of the former Dufferin Grove bakers have left. 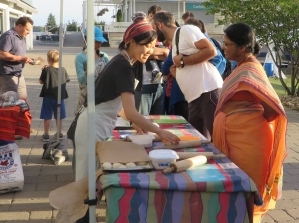 But then we had an idea – ask former park cook and baker (see guest baker project) Yo Utano to come back and visit from Japan for three weeks to help. 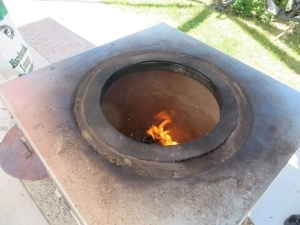 She agreed! 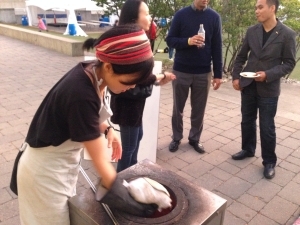 On September 24, two days after Yo got here, the CELOS tandoor was taken to the Harbourfront Centre for a food-related art opening. 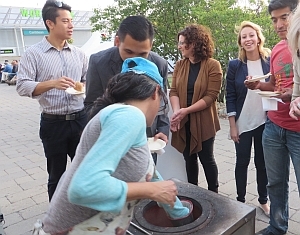 It turns out that artists and their friends really like making their own naan bread in the traditional way – Yo and Dufferin Grove’s tandoor baker Amna Malik were swamped. Amna needs a thick glove! 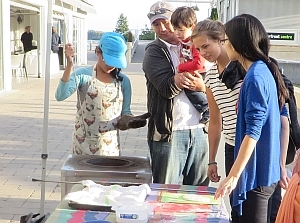 Our friend Gene Threndyle, who built and bakes in the Artscape oven, was having an art opening at Harbourfront. It was called "Forage," i.e. 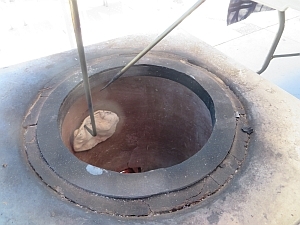 it had a food theme, and so Gene suggested to the organizers that they ought to include a hands-on food activity: making naan bread in the CELOS tandoor. 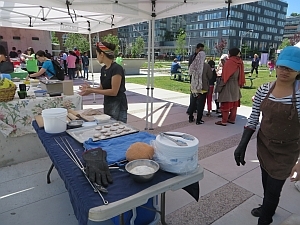 Amna Malik was the lead naan maker, with help from Yo Utano, Mayssan Shuja Uddin and Jutta Mason. 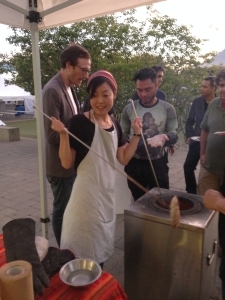 At the June 5 event at Regent Park there was far less interest in the tandoor than in the pizza oven, but at Harbourfront there was no pizza oven. 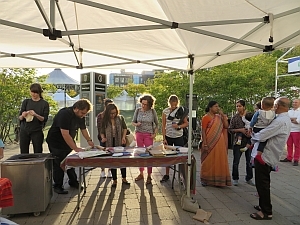 So all evening there were people who came to roll out their own naan bread and then eat it with Amna's lentil topping, or just with butter. 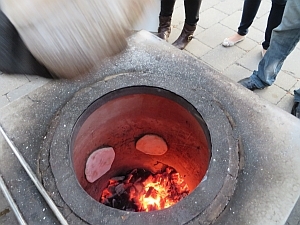 The tandoor: Amna Malik and Nayssam Shujauddin came to Regent Park with the Dufferin Grove tandoor oven, to put on a little side show, with naan bread and lentil topping.